On 18 March 2013 Statoil and its co-venturer ExxonMobil gave details of their third high-impact gas discovery in licence Block 2 in a year. The new discovery (known as Tangawizi-1) is located 10 kilometres from their first two discoveries (Lavani and Zafarani) made in 2012, and is located in water depth of 2,300 metres. The consortium will drill further wells later this year. 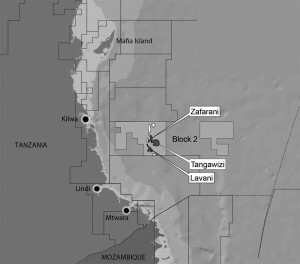 The Tangawizi-1 discovery brings the estimated total volume of natural gas in-place in Block 2 to between 15 and 17 trillion cubic feet (Tcf). Depending on reservoir characteristics and field development plans, this could result in recoverable gas volumes in the range of 10-13 Tcf from just this one Block. These are large reserves by international stand­ards. 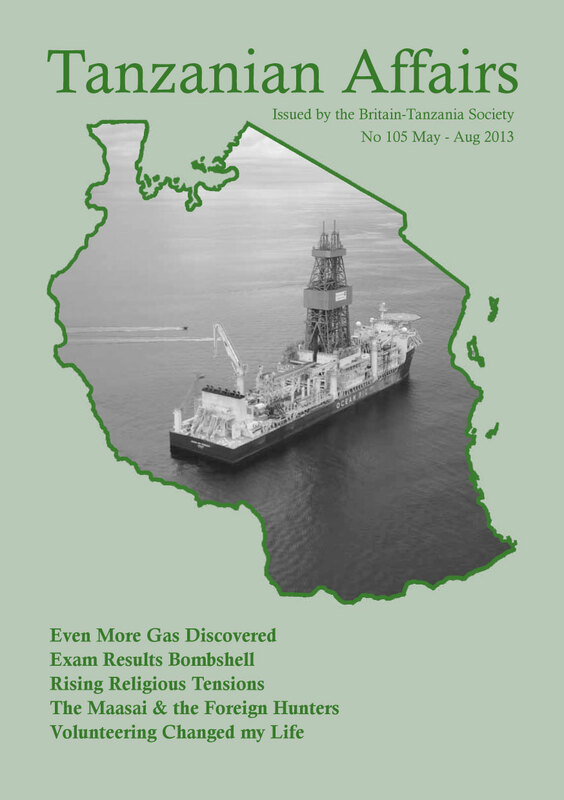 By comparison, Tanzania’s first gas field at Songo Songo island has volumes of about 1 Tcf. Statoil has been in Tanzania since 2007 and has an office in Dar es Salaam. 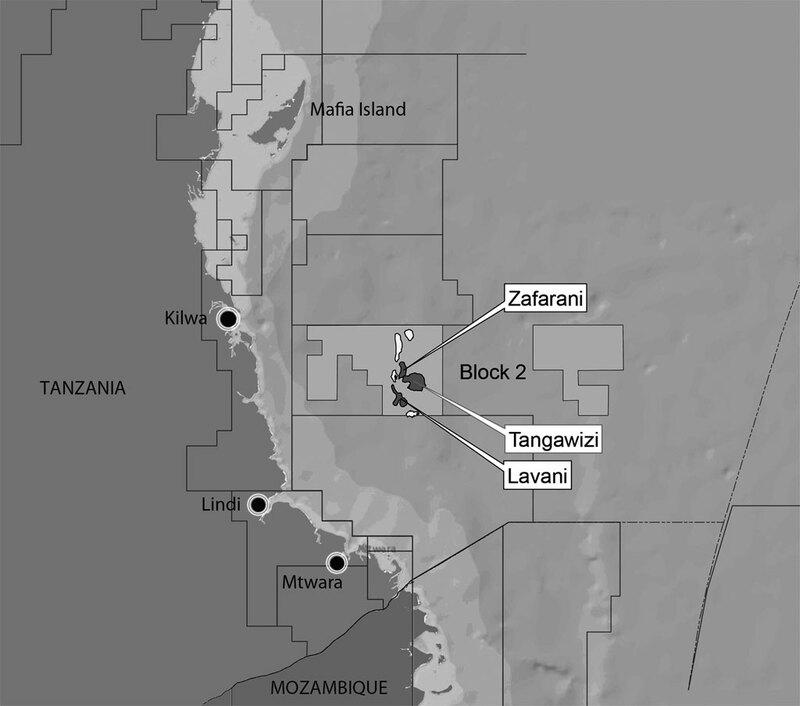 It operates the licence on Block 2 on behalf of the Tanzania Petroleum Development Corporation (TPDC) and has a 65% working interest, with ExxonMobil Exploration and Production Tanzania Limited holding the remaining 35%. It is understood that under the Production Sharing Agreement that governs the operations, TPDC has the right to a 10% working participation interest in case of a development phase. Commenting on the Tangawizi-1 announcement, the Tanzanian Minister for Energy and Minerals, Hon. Professor Sospeter Muhongo, said “The Tanzania Government is pleased to learn about additional gas resources discovered in Block 2 and remains optimistic on future developments”. The Block 2 discoveries complement other recent gas discoveries made by the BG Group. The investors and the Government have both domes­tic gas utilisation and large-scale exports in mind. ‘Come 2023, natural gas will contribute up to 35% of the total market value of officially recognised final goods and services produced in Tanzania, analysts say. But that will happen only after companies that are prospecting for natural gas in the deep sea south of Tanzania get enough finds to attract investors into developing a Liquefied Natural Gas (LNG) facility for dissolving the hydrocarbon product for an export market. Getting to that stage, analysts caution, requires a great deal of patience, commitment, predictability and information sharing among key stakeholders–including the government, investors and wananchi, considering the massive investment required to realise the dream. “You need a great deal of time, expertise and investment before bring­ing such a project to fruition,” said the BG Tanzania head of policy and corporate affairs, Fred Kibodya. “Developing an LNG project requires a massive investment of not less than $15 billion in the region.” His Statoil Tanzania counterpart, Ms Genevieve Kasanga, puts the estimated investment in setting up an LPG project in the region of $20 billion. Tanzania’s GDP now stands at $23 billion. A 35% contribution to GDP, at the current rates, translates into an input of $8.1 billion. This is close to Tanzania’s entire budget of TShs 15.1 trillion (about $9.5 billion) for the current financial year. Agriculture contributes about 24% to Tanzania’s GDP and tourism comes second with a contribution of about 17%. If the country’s current economic growth projection of 6.5% is sustained, and a clear linkage is built between natural gas and the manufacturing and agriculture sectors, Tanzania should graduate into a middle income country. The prospect of sending the gas by pipeline to Dar es Salaam for use by new industries there has caused considerable upset in Mtwara. People there want new industrial plants to be built in Mtwara, where the gas will come ashore, rather than in Dar es Salaam. There have been violent demonstrations in Mtwara, reportedly supported by Mtwara Urban CCM MP Hasnain Murji. In early February, the Citizen quoted Mr Murji, who has publicly differed with the position of his party on transporting gas to Dar es Salaam, as calling for a Select Committee to probe controversies sur­rounding the matter. He asked for the Speaker’s directive on why Parliament had failed to form a committee as had been agreed earlier. House chairperson, Mrs Jenister Muhagama, said nothing could be done because the Speaker, Ms Anne Makinda, had already ruled on the matter. Parliament eventually dropped the idea of forming a select-committee because it was satisfied with the Prime Minister’s handling of the matter. After publication on February 18 of results showing that almost two thirds of students had failed in the Form IV (O’level) secondary school examinations, President Kikwete felt the need to assure the public on radio that education remained at the top of his administration’s list of priorities. He said that his government was touched by the massive number of failures. “It is a shock that, even schools with a well-known history of good performance such as seminaries, privately owned as well as old government schools, performed so dismally…we have to find out why,” He said that various analysts had pointed to reasons for the failure, but that his government would not rely on hearsay. He had therefore asked the Prime Minister to set up a Commission of Enquiry. He noted that the Commission would help the government and other stakeholders to take decisive measures early so as to avert further prob­lems in the future. 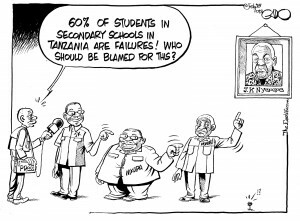 The results were the worst in Tanzania’s history with only 35% of the 367,750 candidates who sat the Form IV exams in October 2012 achieving a pass – a substantial drop from the previous year’s 54% pass rate, itself well down on previous years. There have been similar downward trends in Standard VII results and the Primary School Leaving Exam, where the pass rate dropped from 57% in 2011 to 30% in 2012. Uwezo surveys of literacy and numeracy since 2010 have painted a bleak picture. But it was these Form IV results which saw the greatest outcry, and within days there was a buzz of activity with numerous committees investigating what needs to be done. Mwesiga Baregu, a civics professor at Saint Augustine University of Tanzania, was quoted in the Somali newspaper Sabahi as saying that Minister of Education Shukuru Kawambwa should resign. “If the min­ister is a leader with integrity and responsibility regarding education in this country, he should resign without waiting for pressure from outside. If the minister refuses, President Kikwete should fire him.” Freeman Mbowe, Chairman of the Leading opposition party CHADEMA, said he had organised several public rallies since the examination results were announced to pressure Kawambwa to step down. Prime Minister Mizengo Pinda’s 15-man Commission of Enquiry is led by the Executive Secretary of the Tanzania Commission for Universities (TCU), Professor Sifuni Mchome. Its remit is to understand why the Form IV results were so poor and to make recommendations to prevent this happening again. The NCCR-Mageuzi MP, James Mbatia, refused to join the group feeling it “might create a conflict of interest as he is still pursuing the private motion on the education sector he submitted in parliament” in February. He highlighted the errors in various Government-approved English textbooks as evidence of “deficiencies in the country’s educa­tion system and the alleged corruption encroaching it”. Other areas which needed addressing were the policy framework, curriculum (there were questions over its legality) and the “dire lack of teachers”. The Prime Minister said the Commission would work for six weeks starting on March 4 to review past performance, consider a rescheduled examination for failing students and to determine whether the transfer of educational operations from the federal to local governments contrib­uted to the poor results. The concern about education has led to the release of some significant statistics which give the background to the exam crisis. – 751 number of these in private teachers’ colleges. 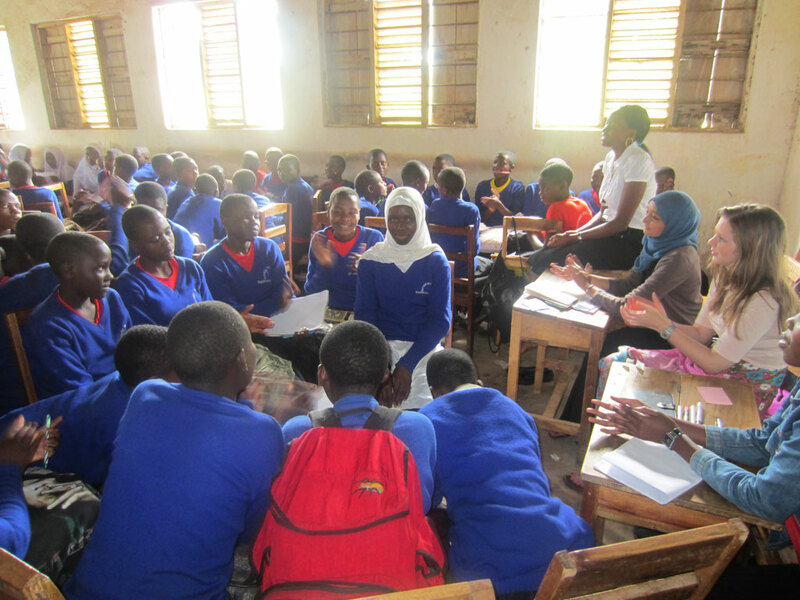 In Mid-February, the Parliamentary Committee responsible for educa­tion invited Village Education Project Kilimanjaro to share its findings and recommendations on improving English in Tanzania. The New Original English Course (NOEC), recently updated with all explanations and instructions in the teachers’ books now in Kiswahili, was featured on various breakfast talk-shows and in the press. The course covering Standards III to VII ensured that pupils were suffi­ciently fluent in English to continue their later studies in English and is seen as an immediate practical solution to rescue the education system from the ‘intensive care unit’. 115 students across 48 schools in Temeke District have benefited from funding by the Parastatal Pension Funds (PPF) through the ‘Education Benefit’ programme which is granted to children of any PPF member who passes away during their service period”. In launching the new Annual Teachers Awards ceremony, Chairman of the Education and Expedition Agency Association, Emmanuel Mjema ‘challenged the government to provide direct financial incen­tives to teachers in public and private schools countrywide so as to help improve the education standard.’ The first ceremony was on 25 November (Guardian 23/11). Mauritius is to introduce student exchange programmes with Tanzania and other African countries as a way to enable them to obtain interna­tional experience. St John’s University has managed to curb cheating by assuming that any cheating starts with leaked papers by the person who sets the paper. The Vice Chancellor noted that there should be no negotiation as cheat­ing was a serious crime which was harmful to academic pursuit and detrimental to the country. The long-running land dispute which began some 20 years ago over the use of the grazing areas in the 4,000 sq km Game Controlled Area at Loliondo may be moving towards a resolution, following the announce­ment of a compromise plan by the government. During the last few weeks there have been several new developments in the saga: The government first announced that Maasai herders were to be expelled so that the agreement between the government and promi­nent hunters in the United Arab Emirates, notably the Othello Business Corporation (OBC), would continue. The Maasai protested vigorously about this loss of their ancestral lands and gained strong support from campaigners and others in Tanzania and around the world. Then in April the government announced a compromise solution, involving a division of the disputed area into two parts. Announcing the new policy to international media representatives, Minister for Natural Resources and Tourism Ambassador Khamis Kagasheki was quoted in the Daily News as saying that the government had decided to allocate 2,500 sq kms of the Game Controlled Area to village communi­ties in Loliondo. The remaining 1,500 sq kms would be retained as the Game Controlled Area for a number of reasons, including protection of wildlife breeding areas and to allow a corridor for the iconic great migration of wildebeest. He said that the government made the deci­sion to parcel out the land to Maasai communities to support landless families in the area. The Minister stressed that there would be no human activities which might destroy the environment in the 1,500 sq km piece of land. It was a malicious misrepresentation of facts for a section of people both in and outside the Loliondo Game Controlled Area to claim that the government was grabbing land from the local communities. This was not correct, the Minister said, since the people had been living in the area illegally because the 4,000 sq kms had been a national resource throughout history and the land had never been allocated to the Maasai communities under any government arrangement. The Minister noted further that the OBC had the rights to certain hunting blocks in the area, which they could use to generate income if they pleased. It is under­stood that OBC pays very heavy fees for its hunting licenses. Although OBC had a contract ending in 2018, the government could still revoke it if need be. STOP PRESS: As this issue goes to the press there are reports that, fol­lowing a meeting in Arusha, thirteen civil and land rights organisations have strongly opposed the government plan, arguing that the entire Game Controlled Area is within legal village boundaries and that the plan therefore still represents a significant reduction in the villagers’ land. There are also concerns that the water catchments and good pas­ture are largely within the proposed Game Controlled Area and much of the land allocated to the communities is dry plains unsuitable for grazing. President Kikwete spoke about the rising religious tensions in his monthly address to the nation at the end of February. He expressed his shock at the situation, asking “Tanzanians have never been this way… what has happened? Some have drawn a link between these attacks and terrorism, includ­ing the East African newspaper. This claim has been lent credibility by reports that US agencies are supporting the investigation into Father Mushi’s murder. Others link the attacks to a growing separatist move­ment on Zanzibar, which seeks independence from mainland Tanzania. Attacks have not been limited to the Isles, however. Also in February, the small town of Buseresere, Geita region, witnessed the beheading of Rev Mathayo Kachila, a pastor with the Tanzanian Assemblies of God church amid religious clashes. This incident and the rioting in Tunduma (see below) related to disputes over whether Christians should have the right to slaughter animals for public consumption. Earlier violence in Dar es Salaam has targeted both Muslims and Christians. At the beginning of April riots in Tunduma on the Tanzania/Zambia border caused the Tanzanian authorities to temporarily close the bor­der. According to the Citizen, the clashes were over ‘religious misunder­standings’ on slaughtering rituals in the border town. The rioting erupted after a crowd gathered to oppose the idea that it was Muslims alone who were permitted to slaughter animals. All social and economic activities were forced to stop for several hours. According to the police, a group of hooligans demanded that Christians should also be allowed to slaughter animals and then proceeded to the Mwaka area in Tunduma, where they destroyed a mosque that was under con­struction. Two people, including a police officer, were seriously injured and forty others were arrested. Police in Mbeya Region ordered the Tunduma Ward Councillor Frank Mwakajoka and a pastor of the Evangelical Lutheran Church of Tanzania (ELCT), Gidion Mwamafupa, to surren­der themselves to the police for allegedly fuelling the violence. 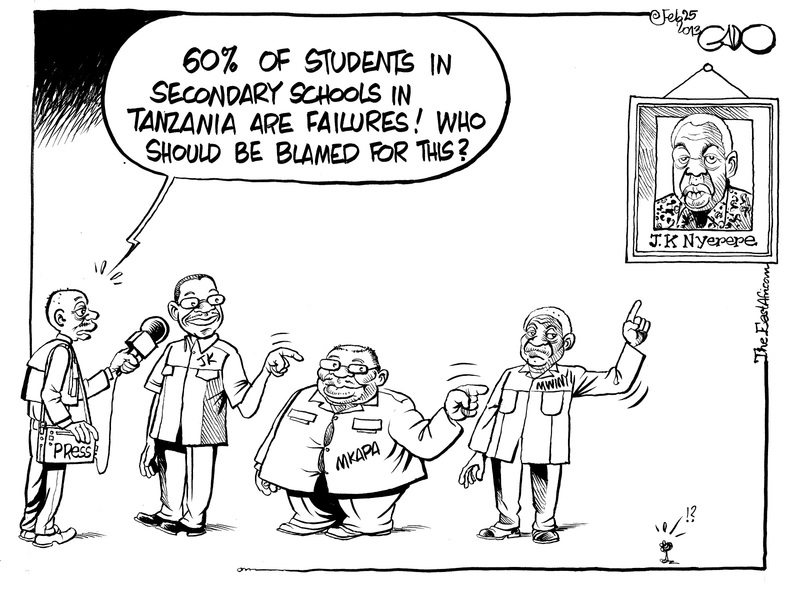 The recently released figures from the 2012 census are giving Tanzanians much food for thought. By comparison, the population of England and Wales in 2011 was 56 million. President Kikwete has been talking about the importance of family planning. “It may not be seen as a problem, especially for a vast country like ours, but it is a big burden economically and socially,” he said. 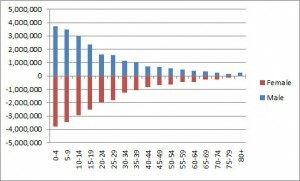 The 2012 census figures support his view showing that 46% of the population are under 15 years old, compared to 18% in the UK. Air Tanzania (ATCL) have resumed flights on the Kigoma-Dar es Salaam route following the successful repair of one of its planes. The Dash 8 plane was grounded at Kigoma Airport after one of its cockpit windshields developed a crack while airborne. The plane had flown for about 30 minutes but landed safely at the airport after the mishap. Swiss Ambassador Olivier Chave has revealed that the Swiss National Bank have found certain ‘shadowy individuals’ who have spirited TShs303.7 billion ($178 million) out of Tanzania to what were described as ‘Alpine offshore havens with a reputation for secrecy.’ During a courtesy call on CHADEMA Deputy leader, Zitto Kabwe, in January this year, he said that if Tanzanian officials provided evidence that the money had been fraudulently obtained, the Swiss national authorities would wire it straight back to Tanzania. “We have done that several times – we once returned cash stashed in our banks by former Nigerian president Sani Abacha,” he said, and added that Tanzania could also recover back taxes on the money. Needless to say this soon created a storm in Parliament. Mr Kabwe said he thought that the Tanzanian authorities did not really want to get the money back. The Kigoma North MP then tabled a private motion proposing the formation of a select committee to probe the matter, but the motion was rejected. According to the Citizen, MPs began to sling accusations and there was apparently a threat that Mr Kabwe would name and shame the thirteen individuals allegedly involved. Prime Minister Mizengo Pinda was adamant that the issue be handled carefully because it was “sensitive.” He assured the public that govern­ment would do all it could to expose the faces behind the Swiss billions. Anti-corruption chief Edward Hosea said his office would do whatever it could to figure out whose cash was hidden in Swiss bank accounts. As the long standing dispute on the ownership of Lake Nyasa between Tanzania and Malawi continued, Tanzania dismissed as “biased and false” a CNN programme which claimed that Tanzania’s border with Malawi lies on the shores of Lake Nyasa. Tanzanian officials said that the broadcast had supported Malawi’s position on the dispute and did not augur well for efforts to settle the matter amicably. The government sent a protest note to the US-based television network on the reports, which it considered to be prejudiced, according to Director of the Tanzania Information Services, Assah Mwambene. Asked whether the government had consulted US ambassador to Tanzania, Alfonso Lenhardt, he said that Tanzania believed CNN to be an independent media house guided by an editorial policy which the US government had no mandate to influence. The border row between the two countries follows claims by Malawi that it owns all of the northern part of Lake Nyasa, in accordance with the Heligoland Treaty of 1890 between the colonial powers Germany and Britain. Tanzania argues that, in accordance with international customary law, the border between the two countries is in the middle of the lake. After failing to reach agreement in 2012 (see TA 103 & TA 104) the two countries agreed that they would submit a letter to former Mozambican President Joaquim Chissano, who chairs the African Forum of former Heads of State within the Southern African Development Community, asking him to arbitrate the matter. In the latest development, Malawi President Joyce Banda said that Malawi was giving up on mediation efforts and would take to the courts to settle the dispute. “We should not waste time on this (media­tion),” she said in Lilongwe after returning from visits to the US and Britain. She said that the mediation bid by ex-President Chisano was “compromised because information submitted by Malawi was leaked to Tanzania”. She accused the executive secretary of the forum, John Tesha, a Tanzanian national, of passing some vital information to his home coun­try. “After surrendering our documents, we were told that they were leaked to Tanzania before the Tanzanians surrendered theirs,” Banda said. “We feel everything is compromised,” President Banda had earlier said the dispute had dragged on for too long and she was considering taking it to the International Court of Justice for arbitration. In August 2012 I quit my well-paid full-time research job to volunteer with the Voluntary Services Overseas International Citizen Service (VSO ICS) programme. Practically every person asked me the same question: “Are you mad – in this economic climate?” and before depart­ing this question replayed over and over again in the back of my mind. Now I have the answer to this question. “No, I am not mad and would do it all over again” – and here is why. Having completed my Masters in International Development, I decided to pursue a career in Development Research which took me from work­ing for a small grant awarding trust to a large international research consultancy. Working from the luxury of a London office, I felt discon­nected and far removed from the realities of international development, which is why I decided to volunteer. I believe that it was fate that I ended up going to Tanzania. I applied online not knowing which country I would be going to if my applica­tion was successful. A few days later, I was invited to an assessment day, which included a group task and an individual interview. The first task of the day was to imagine that there was a world map on the floor and each applicant was asked to stand anywhere on the map and explain their choice of country. I stood in Tanzania, and when probed as to the reason, I replied that I would like to go there sometime. At the end of the assessment day the coordinator told us that she would be in touch and that they had spaces in Nepal, Nigeria and Tanzania. You can’t imagine my excitement hearing that Tanzania was an option, and when I was later informed that I had been placed in the Tanzania programme, I could not believe my luck. The scheme, funded by DfID, is aimed at 18-25 year olds and groups of volunteers are placed in a community for three months, living in host homes and working in cross-cultural counterpart pairs. I found out I would be travelling to Kamachumu, a rural village in Muleba district in Kagera region in north west Tanzania. If you google Kamachumu you don’t get a lot of information, and I thought “what have I let myself in for?” The nearest town, Bukoba, is one and a half hours away on the daladala (I will not be complaining about overcrowding on the British underground again!). My host home was relatively small with just my host mother and father, as their sons live and work in Dar es Salam. Other volunteers were placed in host homes with up to four generations living under one roof. My host mother was keen for us to have a full experience and involved us in family life as much as possible; I experienced the birth of a new­born baby, a visit to see grandparents and the death of a family friend. During the placement we worked with a grassroots NGO called KAVIPE (Kamachumu Vision for Poverty Eradication) on different projects including agriculture, youth, environment, gender and health. I was placed on the health programme. The two main goals of the health team were: (1) to reduce stigma associated with HIV/AIDs and (2) to increase awareness of sound sexual and reproductive health practice amongst women. Kamachumu is home to Ndolage Hospital where the first HIV/AIDs cases in Tanzania were discovered in 1983. The experience was not without its challenges. For example, I don’t think any volunteer will ever get use to the chorus of “Mzungu” (white person/ foreigner) every time you take a step out of the comfort of your host home, nor the relaxed attitude to time keeping (a big issue for us Brits who are sticklers for ensuring meetings start in a timely fashion) and not knowing the local language, but these are what you would call minor concerns in the grand scheme of things. Another challenge for me personally was the food, the staple food in Kamachumu is bananas, we would have fried bananas at breakfast, matoke (steamed green bananas) for lunch, grilled bananas at tea and endless sweet bananas as a treat between meals! Whilst I grumbled about the amount of bananas, the community was worried about Banana Xanthomonus Wilt (BXW) more commonly referred to as ‘banana disease’, which threatens the food security of the region and the live­lihoods/income of many farmers. There is currently no chemical or biological treatment or cure for the disease, which has left researchers puzzled. I soon stopped the grumbling and began to have a new found appreciation for bananas. Despite the challenges, the particular skills that I will take away include working cross-culturally, team work, critical thinking, adaptability, project planning and delivery. I learnt so much about the different types of development, from international development to community development, but more importantly personal development. I was able to experience the beauty that is Tanzania with its luscious greenery, marvellous array of colourful birds, and vibrant culture and make plenty of lifelong friends. I believe this experience has given me a better insight into what it means to really work in international development and will provide me with a clearer perspective on what we are actually hoping to achieve. Prior to joining the scheme, I wondered whether this would be a life-changing experience. To sum up, yes, it has definitely opened my eyes and I think that all young people in the UK would benefit from taking part and should be encouraged to do so – not just to improve their CVs by enhancing their skills but also to experience something that will stay with them forever. Whilst I didn’t get to see the ndovu (elephants), twiga (giraffes) and simba (lions) of the Serengeti, it was a wholly worthwhile experience and one that I would do again in a flash. Samia Khatun holds an MSc in Political Economy of Development from SOAS, a BSc Honours degree in Politics and Economics from Brunel University, and is a Trustee of the Hilden Charitable Fund. Prior to volunteering in Tanzania, she worked at InterMedia, a C4D research consultancy with clients including the Bill & Melinda Gates Foundation, Deutsche Welle and BBC Media Action Swahili.